Despite mentioned in Krause publication, KM#125a 5 fils 1980 Stainless Steel (Mintage: 20,160,000) and KM#126a 10 fils 1980 Stainless Steel (Mintage: 11,264,000), they are never seen. It is widely accepted by collectors that they might never been produced. KM#128 50 Fils. Year: 1980 - AH 1400. Weight: 5.50g. Metal: Copper-Nickel. Diameter: 23 mm. Edge: Reeded. Alignment: Medal. Mint: British Royal Mint. Obverse: CE year written left and AH year on right. Three palm trees with several in the background. 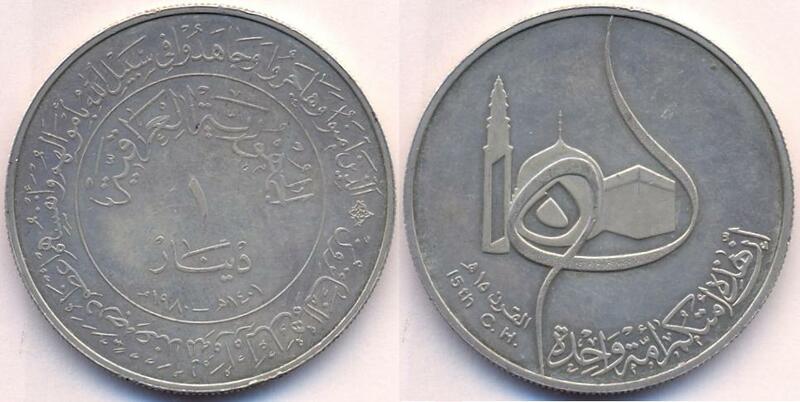 Reverse: "al Jumhuriyah al-Iraqiyah" (Republic of Iraq) written above. Value in center circle above sprigs. Mintage: 23,520,000. Minted Years: 1969, 1970, 1972, 1975, 1979, 1980, 1981 and 1990. KM#146 250 Fils. Year: 1980 - AH 1400. Weight: 13.00g. Metal: Nickel. Diameter: 30 mm. Edge: Reeded. Alignment: Medal. Obverse: President; the party head and revolution leader (below). Reverse: President Combatant Commander Saddam Hussein. Mint: British Royal Mint. Mintage: N/A. Minted Years: one year type. Subject: 1st Anniversary of the Revolutionary Party and Saddam Hussein as the President, Leader and Freedom fighter. KM#173 50 Dinars 16.965g .917 gold. Mintage: unknown. KM#174 100 Dinars 33.93g .917 gold. Mintage: unknown. Scarce coin. Difficult to find. KM#147 250 Fils. Year: 1980 - AH 1400. Weight: 10.00g. Metal: Copper-Nickel. Diameter: 8-sided, 30 mm. Edge: Plain. Alignment: Medal. Mint: British Royal Mint. Obverse: CE year written left and AH year on right. Three palm trees with several in the background. Reverse: "al Jumhuriyah al-Iraqiyah" (Republic of Iraq) written above. Value in center circle above sprigs. Mintage: N/A. Minted Years: 1980, 1981 and 1990. KM#150 50 Dinars 13.00g .917 gold. Mintage: 13,000. KM#151 100 Dinars 26.00g .917 gold. Mintage: 14,000. KM#149 1 Dinar. Year: 1980 - AH 1400. Weight: 13.00g. Metal: Nickel. Diameter: 33 mm. Edge: 10-sided, Reeded. Alignment: Medal. 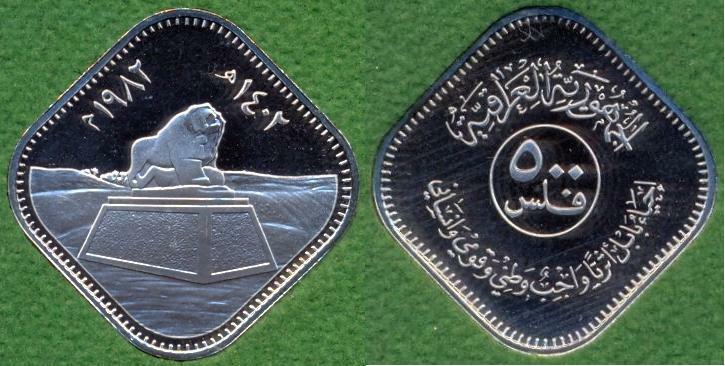 Obverse: Saddam (top left). Quddisiya (top right). Republic of Iraq (bottom). Reverse: President Majestic Combatant Commander Saddam Hussein (written in below banner). Mint: British Royal Mint. Reverse: Bust of Saddam Hussein facing left. Mintage: N/A. Minted Years: one year type. Subject: Battle of Qadissyiat 636-1980 (AH 15-1400). KM#125a 5 Fils. Year: 1981 - AH 1401. Weight: 4.00g. Metal: Stainless Steel. Diameter: Scalloped, 23 mm. Edge: Plain. Alignment: Medal. Mint: British Royal Mint. Obverse: CE year written left and AH year on right. Three palm trees with several in the background. 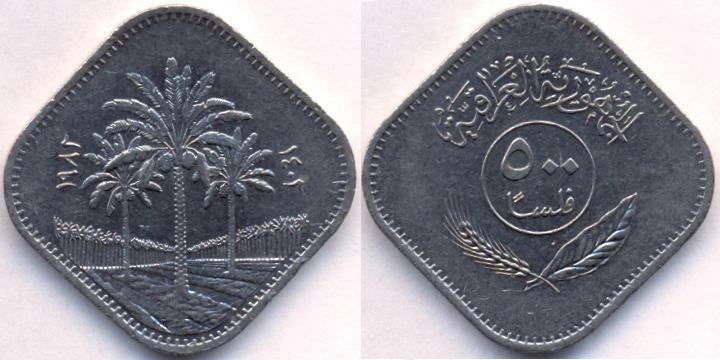 Reverse: "al Jumhuriyah al-Iraqiyah" (Republic of Iraq) written above. Value in center circle above sprigs. Mintage: 29,840,000. Minted Years: 1971, 1974, 1975, 1980 and 1981. KM#126a 10 Fils. Year: 1981 - AH 1401. Weight: 5.65g. Metal: Stainless Steel. Diameter: Scalloped, 26 mm. Edge: Plain. Alignment: Medal. Mint: British Royal Mint. Obverse: CE year written left and AH year on right. Three palm trees with several in the background. Reverse: "al Jumhuriyah al-Iraqiyah" (Republic of Iraq) written above. Value in center circle above sprigs. Mintage: 63,736,000. Minted Years: 1971, 1974, 1975, 1979, 1980 and 1981. KM#127 25 Fils. Year: 1981 - AH 1401. Weight: 2.75g. Metal: Copper-Nickel. Diameter: 20 mm. Edge: Reeded. Alignment: Medal. Mint: British Royal Mint. Obverse: CE year written left and AH year on right. Three palm trees with several in the background. 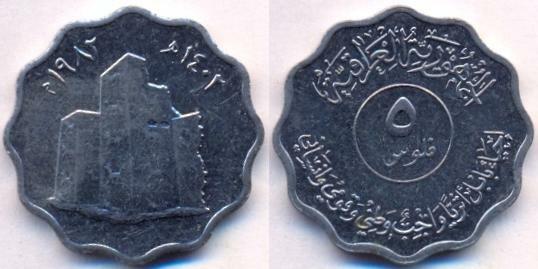 Reverse: "al Jumhuriyah al-Iraqiyah" (Republic of Iraq) written above. Value in center circle above sprigs. Mintage: 60,000,000. Minted Years: 1969, 1970, 1972, 1975 and 1981. KM#128 50 Fils. Year: 1981 - AH 1401. Weight: 5.50g. Metal: Copper-Nickel. Diameter: 23 mm. Edge: Reeded. Alignment: Medal. Mint: British Royal Mint. Obverse: CE year written left and AH year on right. Three palm trees with several in the background. 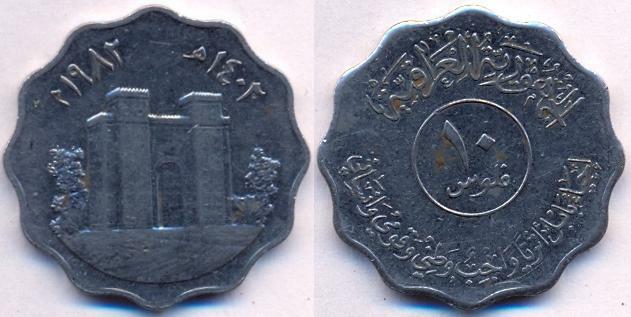 Reverse: "al Jumhuriyah al-Iraqiyah" (Republic of Iraq) written above. Value in center circle above sprigs. Mintage: 138,995,000. Minted Years: 1969, 1970, 1972, 1975, 1979, 1980, 1981 and 1990. KM#147 250 Fils. Year: 1981 - AH 1401. Weight: 10.00g. Metal: Copper-Nickel. Diameter: 8-sided, 30 mm. Edge: Plain. Alignment: Medal. Mint: British Royal Mint. Obverse: CE year written left and AH year on right. Three palm trees with several in the background. 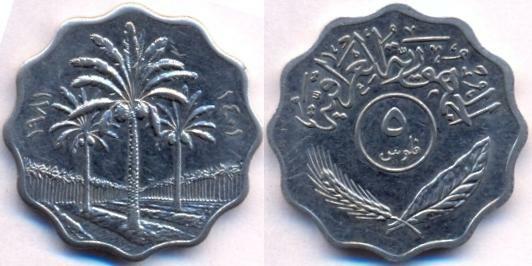 Reverse: "al Jumhuriyah al-Iraqiyah" (Republic of Iraq) written above. Value in center circle above sprigs. Mintage: N/A. Minted Years: 1980, 1981 and 1990. KM#152 250 Fils. Year: 1981 - AH 1401. Weight: 10.00g. Metal: Copper-Nickel. Diameter: 8-sided, 30 mm. Edge: Plain. Alignment: Medal. Mint: British Royal Mint. Mintage: 46,432,000. Minted Years: one year type. Reverse: Republic of Iraq (above). Denomination and FAO logo in center. World Food Day (below). Obverse Side: Quranic Verse: ...wajaAAalna mina alma-i kulla shay-in hayyin... [...We (Allah) made from water every living thing.,...] Chapter#21 Al-Anbiya (The Prophets), part of Verse# 30. Mosul Dam (written below). This dam is also known as Chambarakat Dam and formerly known as Saddam Dam. It is the largest dam in Iraq, opened in 1986, located on Tigris River. KM#153 1 Dinar. Year: 1981 - AH 1401. Weight: 13.00g. Metal: Nickel. Diameter: 33 mm. Edge: 10-sided, Reeded. Alignment: Medal. Mint: British Royal Mint. 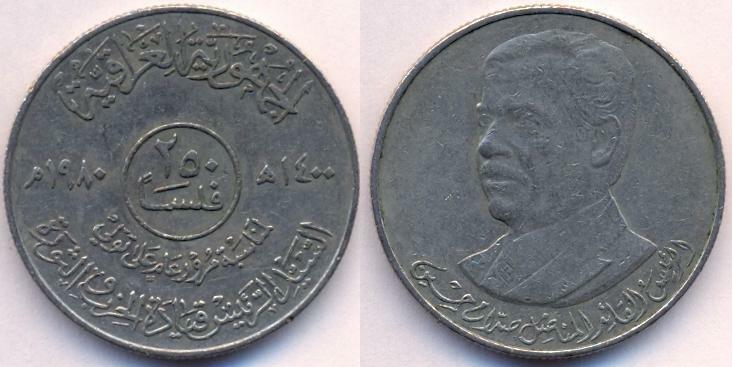 Reverse: Bust of Saddam Hussein facing left. Mintage: N/A. Minted Years: one year type. Obverse: President Majestic Combatant Commander Saddam Hussein (written in below banner). Reverse: Ancient proud nation (top right) - with an eternal message (top left). Republic of Iraq (above center circle). Golden Jubilee [50th Anniversary] of Iraq Air Force 1921-1981 (below). Emphasizing on Arab unity forever. KM#170 1 Dinar. Year: 1981 - AH 1401. Weight: 13.00g. Metal: Nickel. Diameter: 33 mm. Edge: 10-sided, Reeded. Alignment: Medal. Mint: British Royal Mint. Obverse: CE year written left and AH year on right. Three palm trees with several in the background. 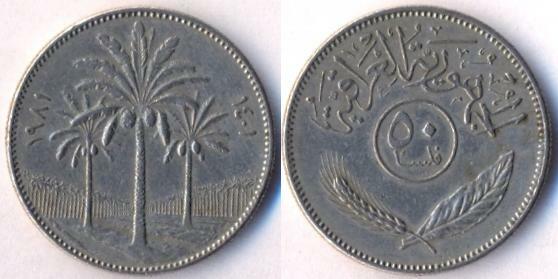 Reverse: "al Jumhuriyah al-Iraqiyah" (Republic of Iraq) written above. Value in center circle above sprigs. Mintage: N/A. Minted Years: one year type. KM#155 250 Fils. Year: 1982 - AH 1402. Weight: 10.00g. Metal: Copper-Nickel. Diameter: 8-sided, 30 mm. Edge: Plain. Alignment: Medal. Obverse: Seventh conference for the Heads of states and Governments of the Non-Aligned countries. Reverse: Republic of Iraq (above). Achievement reflects the aspirations of the people for complete independence (below). Mint: British Royal Mint. Mintage: N/A. Minted Years: one year type. Subject: 7th Nonaligned Nations - Baghdad Conference. This conference was never held in Baghdad and was hosted by New Delhi from March 7-12, 1983. KM#165 500 Fils. Year: 1982 - AH 1402. Weight: 9.08g. Metal: Nickel. Diameter: 4-sided, 32 mm. Edge: Reeded and plain on edges. Alignment: Medal. Mint: British Royal Mint. Obverse: CE year written left and AH year on right. Three palm trees with several in the background. Reverse: "al Jumhuriyah al-Iraqiyah" (Republic of Iraq) written above. Value in center circle above sprigs. Mintage: N/A. Minted Years: one year type. Subject: Denomination 500 Fals. KM#165a 500 Fils. Year: 1982 - AH 1402. Weight: 8.98g. Metal: Nickel. Diameter: 4-sided, 32 mm. Edge: Reeded and plain on edges. Alignment: Medal. Mint: British Royal Mint. Obverse: CE year written left and AH year on right. Three palm trees with several in the background. Reverse: "al Jumhuriyah al-Iraqiyah" (Republic of Iraq) written above. Value in center circle above sprigs. Mintage: N/A. Minted Years: one year type. Subject: Denomination 500 Falsan. KM#156 1 Dinar. Year: 1982 - AH 1402. Weight: 13.00g. Metal: Nickel. Diameter: 33 mm. Edge: 10-sided, Reeded. Alignment: Medal. Obverse: Seventh conference for the Heads of states and Governments of the Non-Aligned countries. Reverse: Republic of Iraq (above). Achievement reflects the aspirations of the people for complete independence (below). Mint: British Royal Mint. Mintage: N/A. Minted Years: one year type. Subject: 7th Nonaligned Nations - Baghdad Conference. Also two gold coin were issued on the same subject: of Non-Aligned Nations Baghdad Conference. KM#157 50 Dinars 13.70g .917 gold. Mintage: 10,000. Scarce coin. Difficult to find. KM#158 100 Dinars 26.00g .917 gold. Mintage: 10,000. In this year a set of ten coins from 5 fils to 1 Dinar were produced with subject: Revival of Babylon archeological as national duty for Humanitarian. KM#159 5 Fils. Year: 1982 - AH 1402. Weight: 4.00g. Metal: Stainless Steel. Diameter: Scalloped, 23 mm. Edge: Plain. Alignment: Medal. Mint: British Royal Mint. Mintage: N/A. Minted Years: one year type. Subject: Babylon - Ruins. KM#159a 5 Fils. Year: 1982 - AH 1402. Weight: 4.00g. Metal: Copper-Nickel. Diameter: Scalloped, 23 mm. Edge: Plain. Alignment: Medal. Mint: British Royal Mint. Mintage: N/A. Minted Years: one year type. Subject: Babylon - Ruins. Proof condition, showing much details images drawn on these stones. KM#160 10 Fils. Year: 1982 - AH 1402. Weight: 5.65g. Metal: Stainless Steel. Diameter: Scalloped, 26 mm. Edge: Plain. Alignment: Medal. Mint: British Royal Mint. Mintage: N/A. Minted Years: one year type. Subject: Babylon - Ishtar Gate. KM#160a 10 Fils. Year: 1982 - AH 1402. Weight: 5.65g. Metal: Copper-Nickel. Diameter: Scalloped, 26 mm. Edge: Plain. Alignment: Medal. Mint: British Royal Mint. Mintage: N/A. Minted Years: one year type. Subject: Babylon - Ishtar Gate. Proof condition, showing much details images drawn on these walls round the gate. KM#161 25 Fils. Year: 1982 - AH 1402. Weight: 2.75g. Metal: Copper-Nickel. Diameter: 20 mm. Edge: Reeded. Alignment: Medal. Mint: British Royal Mint. Mintage: N/A. Minted Years: one year type. Subject: Babylon - Lion. KM#162 50 Fils. Year: 1982 - AH 1402. Weight: 5.50g. Metal: Copper-Nickel. Diameter: 23 mm. Edge: Reeded. Alignment: Medal. Mint: British Royal Mint. Mintage: N/A. Minted Years: one year type. Subject: Babylon - Bull. KM#163 250 Fils. Year: 1982 - AH 1402. Weight: 10.00g. Metal: Copper-Nickel. Diameter: 8-sided, 30 mm. Edge: Plain. Alignment: Medal. Mint: British Royal Mint. Mintage: N/A. Minted Years: one year type. 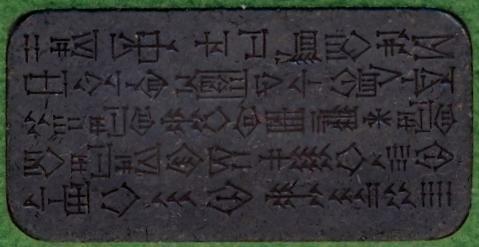 Subject: Babylon - Top of Hammurabi Stele. KM#168 500 Fils. Year: 1982 - AH 1402. Weight: 9.08g. Metal: Nickel. Diameter: 4-sided, 32 mm. Edge: Reeded and plain on edges. Alignment: Medal. Mint: British Royal Mint. Mintage: N/A. Minted Years: one year type. Subject: Denomination 500 Fals. 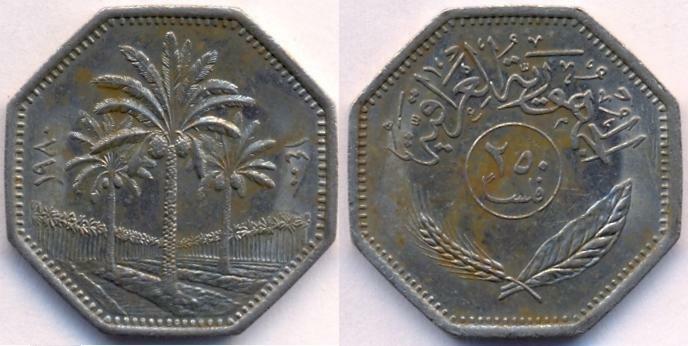 KM#168a 500 Fils. Year: 1982 - AH 1402. Weight: 9.08g. Metal: Nickel. Diameter: 4-sided, 32 mm. Edge: Reeded and plain on edges. Alignment: Medal. Mint: British Royal Mint. Mintage: N/A. Minted Years: one year type. Subject: Denomination 500 Falsaan. KM#164 1 Dinar. Year: 1982 - AH 1402. Weight: 13.00g. Metal: Nickel. Diameter: 33 mm. Edge: 10-sided, Reeded. Alignment: Medal. Mint: British Royal Mint. Mintage: N/A. Minted Years: one year type. Subject: Tower of Babylon. KM#128 50 Fils. Year: 1990 - AH 1410. Weight: 5.50g. Metal: Copper-Nickel. Diameter: 23 mm. Edge: Reeded. Alignment: Medal. Mint: British Royal Mint. Obverse: CE year written left and AH year on right. Three palm trees with several in the background. 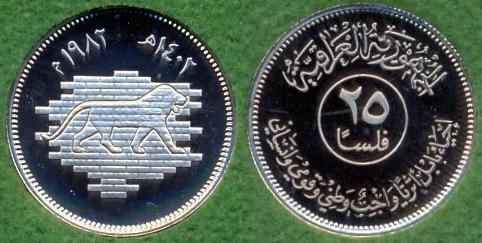 Reverse: "al Jumhuriyah al-Iraqiyah" (Republic of Iraq) written above. Value in center circle above sprigs. Mintage: N/A. Minted Years: 1969, 1970, 1972, 1975, 1979, 1980, 1981 and 1990. KM#147 250 Fils. Year: 1990 - AH 1410. Weight: 10.00g. Metal: Copper-Nickel. Diameter: 8-sided, 30 mm. Edge: Plain. Alignment: Medal. Mint: British Royal Mint. Obverse: CE year written left and AH year on right. Three palm trees with several in the background. 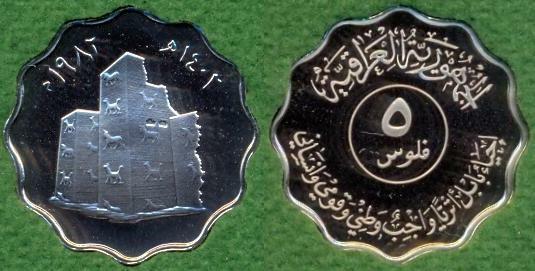 Reverse: "al Jumhuriyah al-Iraqiyah" (Republic of Iraq) written above. Value in center circle above sprigs. Mintage: N/A. Minted Years: 1980, 1981 and 1990. KM#171 5 Dinars. Year: 1990 - AH 1411. Weight: 13.55g. Metal: Bronze. Diameter: 30mm. Edge: Reeded. Alignment: Medal. Mint: N/A. Mintage: N/A. Minted Years: one year type. Slogan: Victory is Ours. Not released to circulation but were produced to celebrate on re-capturing it's own areas from Iran, ending the Iran-Iraq war (22 September 1980 – 20 August 1988). KM#172 10 Dinars. Year: 1990 - AH 1411. Weight: 15.40g. Metal: Bronze. Diameter: 32mm. Edge: Reeded. Alignment: Medal. Mint: N/A. Mintage: N/A. Minted Years: one year type. Slogan: Victory is Ours. The Swords of Qādisīyah, also called the Hands of Victory, are a pair of triumphal arches in central Baghdad. The arches were opened to the public on August 08, 1989.